#19776 - DirectSync APO Motor for 2.5-inch Focusers on Meade, Stellarvue, Astro-Tech, and other Apochomatic refractors. Optec's FocusLynx DirectSync APO system is an aftermarket add-on for several import Apochromat telescopes with dual-speed focusers. 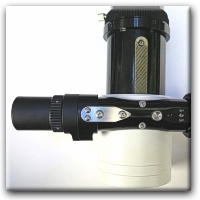 Meade Instruments, Stellarvue, and other telescope manufacturers include compatible focusers for the DirectSync APO motor. Like all Optec DirectSync and QuickSync motors, the new DirectSync APO motor provides a direct drive motor that can be easily disengaged for manual focusing. 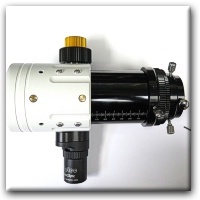 The DirectSync APO motor kit is easy to install and provides a digital focusing solution that also allows manual focus when at the telescope. DirectSync APO Motor fits several Apochromat focusers. The FocusLynx DirectSync APO package was designed especially for the Meade Series 6000 apochromat triplet telescope series but also fits the Stellarvue SV70T and the Access Series. A full list of compatible telescopes and focusers is provided below. With a direct gearing system that leaves the planetary reduction assembly and unique tensioning system intact, DirectSync APO can achieve greater positional repeatability and carry imaging camera packages in excess of 5 kg (11-lbs). The #19776 DirectSync APO motor fits the following telescope focusers. William Optics Gran Turismo 71 APO Refractor. The DirectSync APO includes the #19776 DirectSync APO motor only for owners of the FocusLynx Control Hub. Other options may be ordered separately. 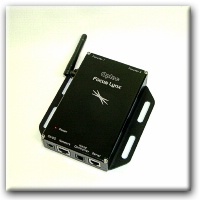 The FocusLynx DirectSync APO Kit includes both the #19776 DirectSync APO motor and the #19690 FocusLynx Control Hub. Other options may be ordered separately. The FocusLynx DirectSync APO-HC Kit includes the #19690 FocusLynx Control Hub, #19776 DirectSync APO motor, PLUS the #19695 Hand Controller Option. Additional options may be ordered separately. 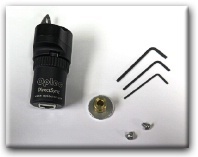 Click here for the DirectSync APO Installation instructions.